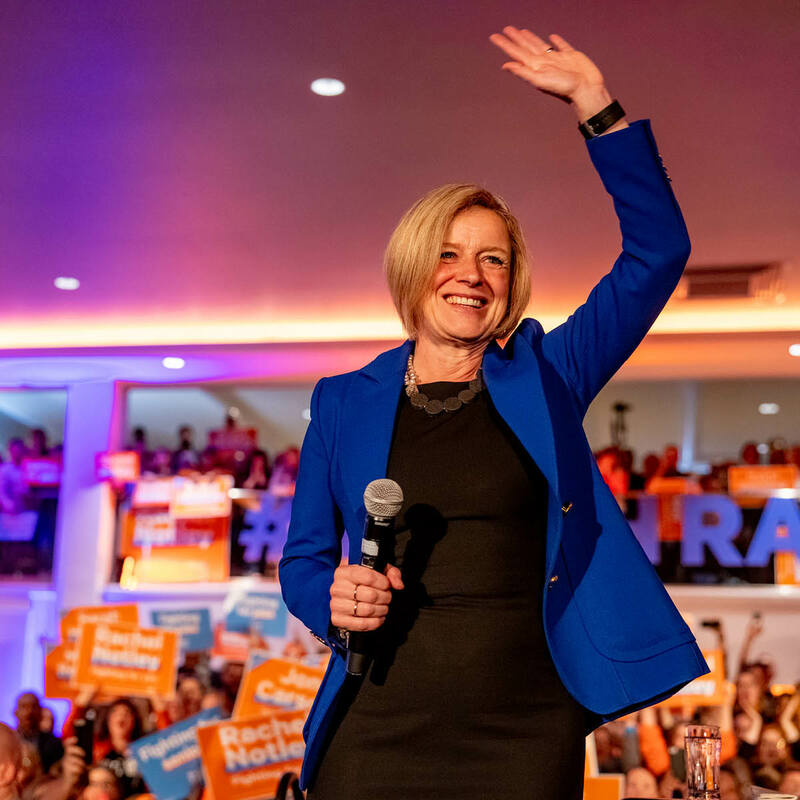 At a packed rally in Edmonton on Sunday, Rachel Notley talked about massive momentum leading towards election day on Tuesday. Notley continued to appeal to voters who might not have voted for her in 2015, but want to defend Albertans from the risk posed by a Jason Kenney government. “It's not a UCP province, it's not a Liberal Party province, an NDP or Alberta Party Province," said Notley. "Alberta belongs to all Albertans. Albertans expect a government that fights for all Albertans." Beyond surging polls and growing doubts about her opponent, Notley pointed to huge momentum on the ground. The demand for NDP lawn signs has actually created a national shortage of orange ink. With more than 10,000 volunteers working for her re-election, Notley said her vision of one Alberta is bringing more people together. With 2,000 people packed in Edmonton's Polish Hall, the rally mirrored support shown at a Calgary rally that saw 1,200 people packed in. Notley was joined on stage by Paul Smith, a 66-year-old farmer and councillor in Strathcona County. Smith talked about working with Notley's government, about her strong plan for economic diversification and relentless fight for pipelines. After voting Progressive Conservative for four decades, Smith said he's standing up with Rachel Notley. Notley said many Albertans are expressing doubt about Jason Kenney's economic record. A report issued this week by a risk analysis firm that says Jason Kenney would cause chaos and uncertainty for the Alberta energy sector while putting the Trans Mountain pipeline at risk. Notley kicked off her speech with jokes about Game of Thrones, one of her favourite shows returning to the airwaves after a long hiatus. Just like the HBO hit, the UCP campaign has been full of "shocking betrayals, intense internal fights, attacks on kids and the most vulnerable." Notley added that "just like in Alberta, the bad guys, the White Walkers, aren't going to win." Before Notley took the stage, Jason Kenney was dodging media outside an event, forcing reporters to run after him. Reporters have been trying to get Kenney on the record about an RCMP raid on the business of Calgary-East Candidate Peter Singh, one of several ongoing police investigations into the UCP. The risks of a Kenney government are real, Notley said, and go beyond economic instability. Because of Kenney's promises to hand over a reckless $4.5-billion tax break for corporations, public services will be slashed. Notley is promising to fight for jobs and steady public services while preserving Alberta's low tax advantage. Her economic plan will see balanced books in four years. While momentum is building, Notley asked Albertans to ensure a brighter future for one Alberta. "On Tuesday morning, get up a little earlier, make your coffee then go to the window," Notley said. "Take in that bright orange sunrise. Then get your vote-pulling shoes laced up and bring this one home!"